Despite putting 50 shots on netminder Patrick Killeen, the Genting Casino Coventry Blaze left Milton Keynes with a 4-2 defeat in the Challenge Cup. Eric Neiley put the home side ahead on 3.46, finding the puck in a scramble to beat a grounded Miika Wiikman. Blaze Captain Kevin Morris tied things up at 8.27 tipping home a Nicolai Bryhnisveen shot on the powerplay. Canadian forward Tim Crowder, who was later named Man of the Match on his debut picking up his first point for the club with the second assist. On 18.41, Crowder was again the architect, this time finding Ben Lake who beat Killeen for his third goal in as many games to give Coventry a 2-1 lead. Michael Fine, who later grabbed the empty net goal and Man of the Match award for MK made it 2-2 on 27.36. Batting one out of the air in front of Wiikman, David Norris put the Lightning ahead 3-2 (35.37). 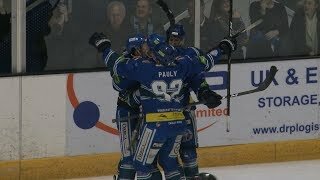 Blaze piled on the pressure in the third but despite pulling their goalie for a 6-on-4 advantage late in the game, try as they might, they couldn’t find another way past the inspired MK goalie. 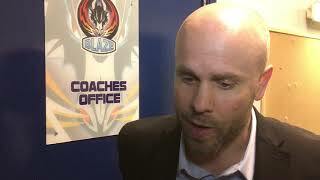 With Fine scoring into the open goal with 9 seconds left to end the game 4-2, Blaze Head Coach Danny Stewart was left ruing his sides missed chances.